Things used to be so simple for Father Christmas. Every home had a fireplace with a chimney – and many homes had several – so gaining access on Christmas Eve was easy. Nowadays, there are still plenty of chimneys – the old ones are still there and even new houses are often built with them – but there’s a new menace in the family home. Pinewood Manor, Breary Banks, Healey, Ripon - �1.25m with Fine & Country, 01423 720944. Wood-burners started gaining ground, and fireplaces, about 20 years ago, but their popularity has really taken off within just the last five years. As a result, the majority of those grand old fireplaces that grace the country homes and converted farmhouses of our district are now pretty much forbidden territory for poor old Santa – sealed, flued, lined and kitted out with a glass-fronted burner that is fuel-efficient and wonderfully warm, but which could spell doom for Christmas Eve deliveries. Which is a shame. No-oneknows exactly how long Father Christmas has been squeezing down chimneys with his sack of presents, but it may well be a very long time. The tradition was widely popularised during Victorian times, but its origins may go back much further. In pre-Christian pagan lore, hearths were thought to be homes of spirits which could influence the wealth of the household, and fire was held in a sacred light. Because of this, gifts left on a hearth symbolised goodwill and prosperity. Springwell House, Church Street, Kirk Hammerton - �1.175m with Strutt & Parker, 01423 561274. In Norse tradition, Odin climbed down chimneys on the solstice (December 21) to mark the beginning of winter. Fortunately, some home-owning parents evidently still want them to benefit from Santa’s largesse, and have retained their open fireplaces. The following homes have fine examples of the increasingly rare traditional chimney and hearth. Stockings not included. Pinewood Manor is a half-timbered Edwardian property at Healey, on the edge of the Swinton Castle Estate, near Masham. Detached and half-timbered, it makes for a striking presence in the rolling countryside of the River Burn, a tributary of the Ure. It has six bedrooms, three bathrooms, large dining kitchen, utility room, pantry, study and two good-sized reception rooms. To the rear of the house there’s a swimming pool complex with a heated pool and changing facilities. There are also three stables and a tack room, plus pony field, and further acres are available for exclusive use. As if that weren’t enough, attached to the garage there’s also a separate one-bedroom cottage which is currently in use as a home office but could easily be converted to living accommodation. Apartment 5, Nidderdale Hall, Bewerley - �179,950 with Dacre, Son & Hartley, 01423 711010. 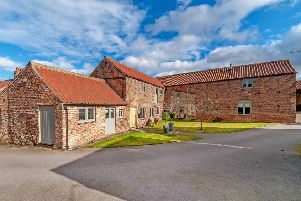 Just opposite the ancient church at Kirk Hammerton, Springwell House is a beautiful Georgian farmhouse dating to about 1795. It has five bedrooms, three bathrooms with underfloor heating, three reception rooms (with fireplaces), breakfast kitchen, study and temperature-controlled wine cellar. Outside, there is a double garage, plus mature landscaped gardens. ed from the old hall on the Mountgarret estate. The second-floor flat has two bedrooms, kitchen, lounge, bathroom and utility area, plus allocated parking for two cars, access to well-kept gardens and stunning views across Nidderdale.